100% Sauvignon Blanc, a multi distinct blend with fruit sourced from Darling, Stellenbosch and Paarl, left on the lees for 3 months before blending and bottling. Predominant flavors are those of tropical fruit with herbaceous overtones, leaving an overall impression of elegance and delicacy with a long fruity finish. Gazpacho, Baby Spinach Salad with Goat Cheese, Lemon-herb Chicken. 100% Verdejo, Beautiful nose of white blossoms and fresh fruit with hints of papaya. On the palate is a nuance of lemon custard with bright apple notes. It is a focused and balanced wine that is perfect for a spring or summer picnic or light fare. Stuffed Mussels, Oysters, Blackened Whitefish, Grilled Vegetables, Shrimp Paella. Off-dry, Ripe peach flavors balance lively acidity, hints of lime and characteristic minerality. The fresh, balanced taste of clean slate is achieved by carefully selecting grapes from vineyards throughout the Mosel. The steep blue slate slopes of the Lower Mosel give the wine its minerality while the Middle Mosel provides a hint of spice to complement the characteristics fresh peach flavors of the Upper Mosel. spicy cuisines, Asian, Tex-Mex, Indian and sushi. Grilled Cheeseburger, Roasted Mutton, Chile Colorado. Tupungato Passo Doble Red is one of Argentina’s unique wines—Masi’s specialty process of double fermentation uses fresh Malbec grapes and a percentage of lightly dried Corvina grapes. This technique deftly combines the history from the Veneto with the richly flavored Malbec grape from Mendoza. The wine is rich with ripe, black fruit flavors with vegetal and licorice notes and finishes with a soft, long finish, with vanilla traces and minerality. Displays complex ripe red fruit aromas, . Baked plum and Grilled Lamb, Roasted Pheasant, Gruyere or Aged Cheddar Cheese. Clancy’s Red is a pure Barossa wine, a collaboration of winemakers and growers who believe in making honest wines that punch above their weight. A blend of Cabernet, Merlot and Shiraz, this wine is soft and supple and full of juicy flavour. A deep cherry red color leads to a bouquet showing blackcurrant from the Cabernet, vibrant red fruits from Shiraz and Merlot and charry oak in the background. The palate shows rich plummy bright red fruits, and long, savoury tannins adding complexity. WINE CLUB! September 2017 Selections. The Wine buyers (Andrew and Dale) pick two wines each month for you that we love, and you will too. One white (or rose, or bubbly) and one red. 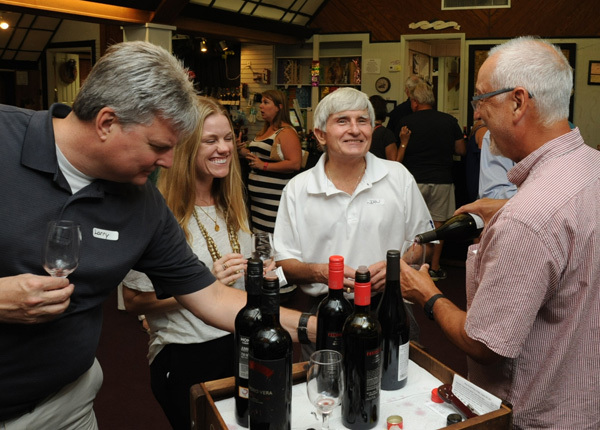 The total value of wines will exceed $40, and the longer you sign up for, the better the deal! (see below for pricing and perks) Our goal is to show excellent wines in a wide range of styles. We only choose wines we have tasted and don’t base our choices on ratings. 75% Chardonnay, 25% Pinot Noir. A super Yummy Rosé, the blend is inspired by Champagne. Most Rose is made by letting the white juice of red grapes sit on the skin fo a short period of time. We suspect that this wine was made instead by blending the Chardonnay and Pinot Noir, although I couldn’t find any specific info. The grapes come from a single vineyard from McMinnville AVA, a sub AVA of the Willamette Valley. The winemaker, Andre Mack was a Somellier at the famous French Laundry and was the first African American to win the title of Best Young Sommelier in America in 2003. We have another of his wines in the store, a lovely Pinot Noir called “O.P.P”, or Other People’s Pinot. of wild strawberry, watermelon rind and a hint of kiwi. This is our one of our “Go To” California Cabs under $25 Big bold Paso Robles fruit with nice supple tannins, this is a serious and easy drinking cab all in one bottle. Gary Eberle has been making wine in Paso since the mid seventies and released the first Eberle Cab in 1979. He’s know as the “Godfather” of Paso Robles Winemaking. Chris Eberle (No Relation!) is the current Winemaker, while Gary and his wife Marcy oversee operations. “Cooked blackberries, baked black plum, grape candy and lilac touches show on the nose of this bottling, which is easy to like and uncomplicated. Violet floral flavors kick off the palate, followed by coffee spice, cedar and dark berry fruit, all framed by moderate tannic tension. 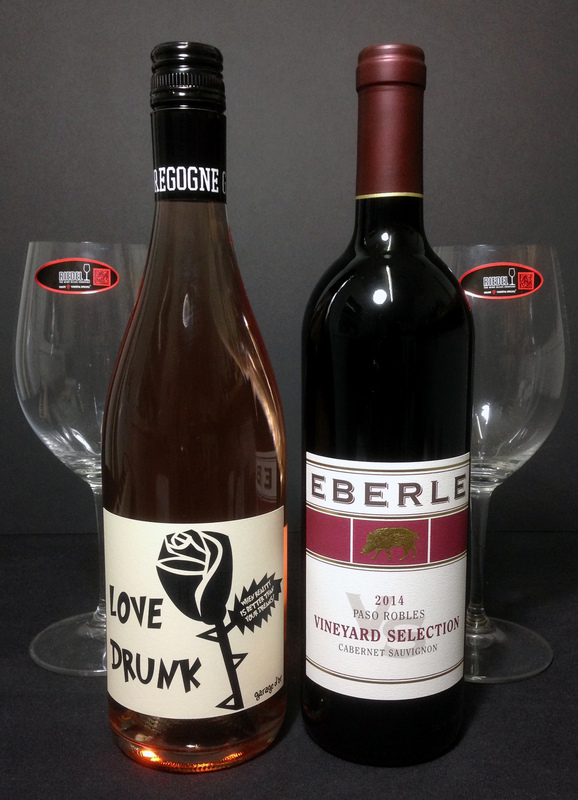 Eberle’s Vineyard Selection Cabernet Sauvignon displays 100% varietal characteristics blended from several distinguished Paso Robles vineyards, including the Eberle Estate Vineyard. This well-balanced Cabernet has a silky mouthfeel with flavors and aromas of blackberry jam, ripe plums, and toasty oak with a dry lingering finish. The Vineyard Selection Cabernet Sauvignon is so approachable that can you enjoy it by the glass or with hearty fare. The rich dark fruit flavors and moderate tannins found in the 2014 Vineyard Selection Cabernet Sauvignon make it a complement to a variety of favorite dishes including braised lamb shanks with rosemary, a steak sandwich with goat cheese butter or a juicy rib-eye steak with a dollop of blue cheese.